This is an exciting week here at Crane & Canopy headquarters. Not only is it the beginning of the holidays, we launched our Luxe Collection, which features our introduction of beautiful jacquards, made by one of the finest linen factories in the world. What is a jacquard weave and why is it so unique? A jacquard weave is created through a loom process, which is programmed to raise each warp thread independently of the other threads. 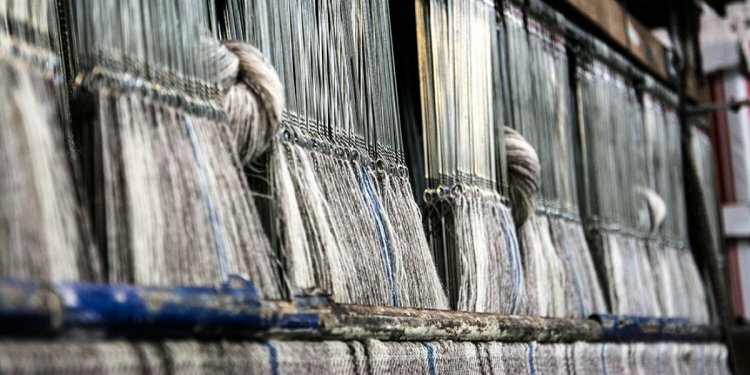 The design of the textile is incorporated into the weave, instead of being printed or dyed onto the fabric. The loom attachment allows a much more versatile weaving process and a higher level of control. The term “Jacquard” itself is after the inventor of the loom attachment that creates this added control, Joseph Marie Jacquard. This weave process is more time consuming and labor intensive than a basic weave. However, jacquard fabric is more stable and stretchy than fabrics created through the basic weave technique. Jacquard weaves can also be combined with various colors and types of threads. This provides beautiful and soft gradations of color tones and bold outlined patterns that are very complex, such as landscapes, portraits, and unique designs.